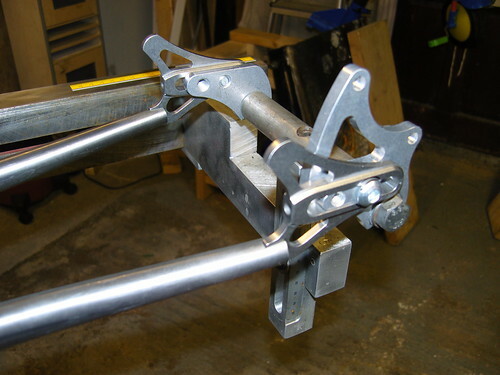 Now that we’ve got some slotted chainstays, I’m fitting them up in the jig with the dropouts in place to make sure everything fits nice and snug. Since the stays are at an angle to the centerline of the frame, they come away from the dropouts at an angle. Normally you can achieve this by either bending the dropout tab so it points in or slot the stay at an angle. On this frame, you probably can’t tell but I’ve actually done a bit of both. 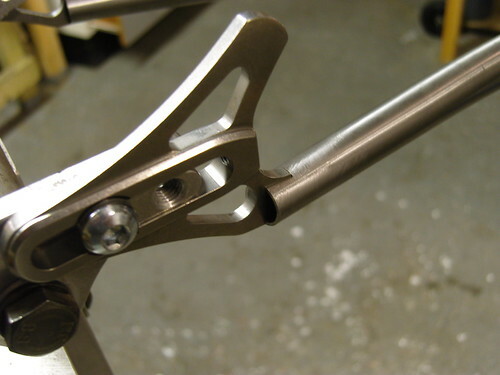 I wouldn’t have been happy slotting the stays at such a big angle and there’s not a very big tab on the Paragon dropout to be able to bend it much. so I’ve done a little of each. You can see the tab is bigger than the diameter of the tube, so it sticks up a bit above the tube. Some people leave it like that or maybe file it to a nice arrowhead/point. I think on this frame I’ll shape it down so the curve of the dropout blends into the stay. I think I might also scallop the end of the stay on this one.